Generally, Sellier & Bellot is known as a top tier producer of military caliber ammunition with a modern loadout made with modern components that are reliable and consistent rounds across the board. This is a unique and interesting round for S&B however for a couple reasons. 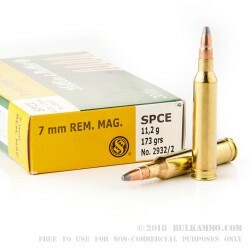 This is a SPCE (Soft Point Cutting Edge” projectile which offers a better rear gas seal on the projectile in the muzzle and offers a mechanical functionality to the bullet which increases deformation and grain weight retention at impact. The large projectile in this unique configuration enhances the stopping power of the already quite potent 7mm Remington Magnum cartridge. Another unique aspect of this load for S&B is that they typically focus on the military loads for most part. This 7mm Rem Mag is about as “civilian” a load as you can find. It is directly marketed to and for the civilian market, even if the United States Secret Service did adopt 7mm Rem Mags at some point for their counter sniper program, and some law enforcement agencies have done the same. This is a 173 grain projectile in a SPCE profile with a brass casing and a Boxer primer, making it easily reloadable. I have always used S & B ammunition in my pistols so when it came to a 7 mm hunting round, I decided to try them. The good luck I had with their pistol ammunition did not extend to my rifle. I fired four rounds and had four jams. The primer was either sticking to the firing pin of the rifle or getting blown out, creating an outward dent in the primer. Either way, the bolt on my rifle jammed shut. In fact, the primer fell out of the cartridge on the last round I fired. The rounds did fire cleanly and were semi-accurate, with less kick than other 7 mm ammunition I have used. I just won’t even try to use it again due to the aforementioned jamming problems. The service here at Bulkammo is always excellent with all of my orders shipped within 24 hours the next business day and delivered within two or three days. Q: What is the energy and drop ballistics at 300 yards?